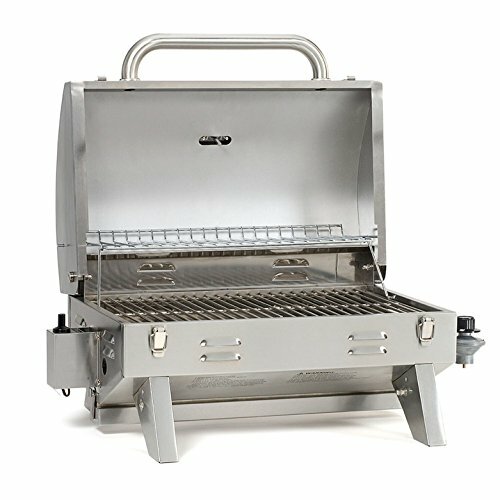 The portable gas grill marketplace is sometimes flooded with cheap options that have a relatively short lifespan. Yet there are some quality manufacturers who are making a name for themselves amongst the more established brands. Just a few years ago Smoke Hollow was acquired by Masterbuilt, who set to work reinvigorating the brand and infusing it with the quality it needed to compete. This included taking some established grills in their line and making some minor upgrade improvements. 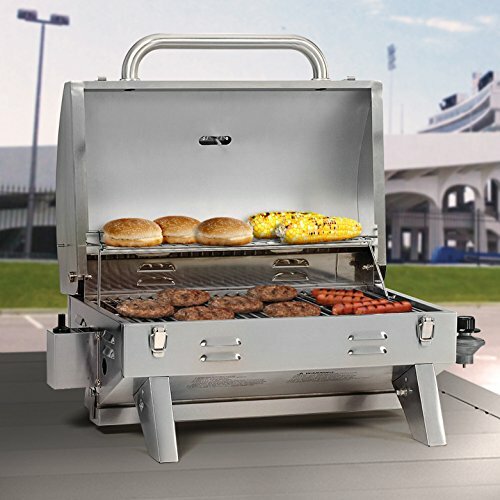 One such unit that received a nice upgrade is the Smoke Hollow 205 Stainless Steel Portable Gas Grill. 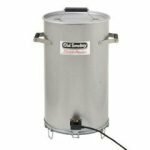 The majority of its components are made from commercial grade stainless steel. It was also designed with portability in mind. The legs fold up and the lid has secure latches to hold everything together while you need to move it. Yet it only weighs 20-pounds, so it’s not going to wear you out if you need to carry it a campsite or a tailgate party. 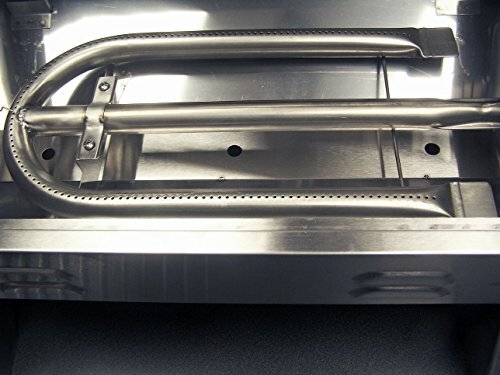 The U-Shaped stainless steel burner has been upgraded to 12,000 BTUs. Its U-shape also provides more consistent heating with less hot and cold spots across the stainless steel grill grate. The burner element is designed to run off a 1-pound propane cylinder and comes with a push-button igniter. However, you can purchase an accessory adaptor and hose if you prefer to use a larger propane tank. There is no natural gas conversion available for this grill at this time. The base also has a large, long, and easy to remove grease/drippings tray. The 100 square inch warming rack is chrome plated to help match the visual identity of the otherwise stainless steel grill. The redesign and upgrades to the 205 Portable Gas Grill match or exceed most of its competitors in this niche. It is sturdy, yet lightweight, and easy to carry. You just have to get used to the fact that there is only one handle and it carries like a briefcase, instead of a top handle that would carry like a bucket. The instructions are another place where there were some nice upgrades. They are easy to read, which makes the grill easier to assemble. With the basic tools you already have laying around the house you should be able to have it put together in a little over half an hour. While the U-shaped burner element is intended to produce more consistent heat, there is none-the-less a hot spot on the left side of the grill, where the element curves back. It’s not a major inconsistency, but you will notice it if you are cooking a large batch of uniform things like bratwurst. Grilling a ring sausage over a U-shaped burner element will also conjure up nightmares from some long-forgotten high school geometry class. If you dial it in just right the U-shaped burner can be used to create two heat zones. This would be high heat on the left and medium on the right. It’s not enough difference to allow you to hybrid grill, but you could use it for things like stuffed pork chops that need to be initially be cooked by standing on the bone, before searing and finishing the sides. 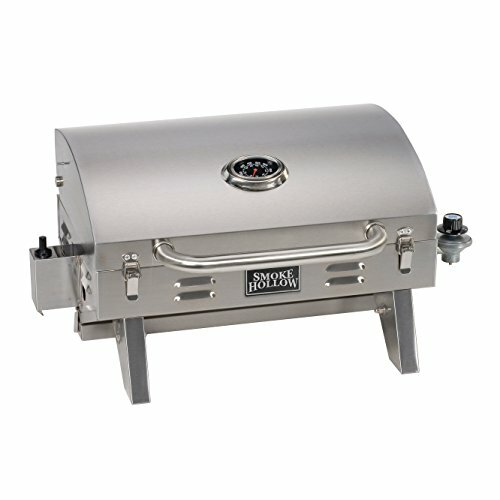 The Smoke Hollow 204 comes with a 205 square inch stainless steel primary grill grate. It also has a 100 square inch warming rack. This gives you a grand total of 305 square inches of cooking and heating space. The so-called “Commercial Grade Thermometer” built into the lid isn’t really all that special. 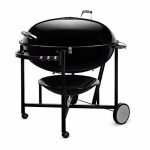 Yet it isn’t something you find in a lot of the competitor gas grills for the same price. The folding legs and latching lid also help with portability. There isn’t a lot of complicated cleanup with the Smoke Hollow 205. The grates will need to be scraped down, as they are a little on the sticky side. Using nylon bristled grill brush will reduce scratches on the stainless steel. The dripping tray at the bottom of the cook box latches in place securely. It’s easy to remove. Just keep in mind that it’s really long and can be a little awkward. It’s also hard to tell just how much fluid is in it until you start pulling it out. So be a little extra careful to avoid spills. If you get any spatter on the exterior of the grill, you should wipe it down with a soapy, wet, non-abrasive kitchen sponge. The Smoke Hollow 205 comes with a 1-year limited warranty. It also requires you to register the grill, as the warranty period starts from the date of initial purchase. This is pretty much on par with most of the competitors in this category and price range. Though there are some that offer a two-year limited warranty. There are also some online retailers who offer very affordable three and four-year additional protection plans. The Smoke Hollow 205 has a nice gleam to it. It’s easy to assemble. Easy to pack, and easy to carry. While it’s meant to be used as a portable grill. It’s big enough and gets hot enough to live on your deck or patio. If you are going to use it as your “Daily Griller” I would recommend splurging the extra money to buy the adaptor, and hose for a larger propane tank. When you compare the cost to the all the 1-pound canisters you’ll go through in a year the adaptor, hose, and tank will quickly pay for themselves.